While all eyes were on Chautauqua in the special 1000m trial at Rosehill, there were a few hidden runs that shouldn’t be overlooked. The Punters Intel chips were carried by all eight triallers and you may not have noticed third placed Dixie Blossoms finishing the gallop off strongly. Ron Quinton’s six-year-old worked home in 33.69 for her last 600m, second best behind Chautauqua, including an 11.10 final 200m. She’s a consistent mare with a solid first-up record and on her performance on Saturday she’s returned in good order. Chris Waller’s three-year-olds Zousain and The Autumn Sun are tracking along well for their returns, with Zousain running 33.97 (11.27 last 200m) and the unbeaten The Autumn Sun sliding home in 33.93 (11.19). To Chautauqua and the grey flash easily clocked the best last 600m of the trial in 33.17, he ran 10.71 from the 400m-200m and an 11.02 last 200m. Add to that, his slow start saw him some 37m off the lead at the 800m. Godolphin import Avilius continued his rise through the grades and while it looked hard work to the eye the merit in his win in the Premier’s Cup (1900m) is backed up by the data. He ran the last 600m in 34.47, which compared well with the best last 600ms of the day considering the longer trip, and clocked the fastest 400m-200m of the race of 11.15 and last 200m of 11.47. There should be plenty of form coming out of the TAB Highway (1100m) on Saturday with the placegetters each impressing for different reasons. Winner Common Purpose covered more ground than the placegetters with an extra 9.2m, while his last 600m of 34.93 was solid the work was taking its toll late as he ran 12.04 for his last 200m. Runner-up Equal Balance clocked 34.65 for his last 600m and was hitting the line nicely in 11.50 for his final 200m. The eye-catcher was Highway Sixtysix who after a slow start was some 27m off the lead at the 800m, she ran the fastest last 600m in the race of 34.33. That included 11.26 from the 400m-200m and 11.45 for her last 200m. Highway Sixtysix’s last 600m was only 0.05 slower than San Domenico Stakes winner Graff who clocked the equal fastest final 600m of the day running 34.28. He covered less ground than the placegetters, gaining inside runs, and given he’d hit the front he was never going to be caught as he ran the best last 200m of 11.72. There was merit in the first-up run of Performer, in third, who ran the fastest 400m-200m of 11.08 then home in 11.90. He also covered an extra 8.3m in the run. Don’t Give A Damn showed he’s back to his best form with a strong first-up win at 1200m, his last 200m in 11.57 was just 0.01 slower than the race best suggesting he still had something in the tank. The fastest last 200m was run by Renewal in 11.56, and he also ran the best last 600m of 34.32 in the race though covered 5m less than the winner. Both are in for handy spring preps. A blueblood on debut at Newcastle served notice she has some ability and her name is Girl Tuesday, who scored a super first-up win over 1400m. 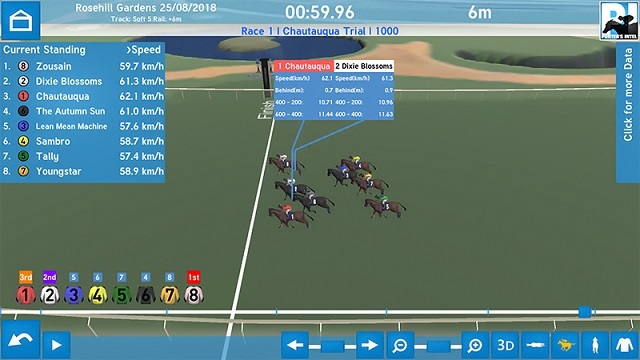 She was the only horse in the race to break 12 seconds for the last 200m (11.79) and her last 600m of 34.63 was just under 0.9 seconds faster than anything in the race. Most ground covered (to win): Paret (+12.2m).